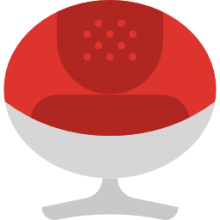 Swivel seat cushions work in cars (usually) or regular chairs, enabling users to perform 360 degree turns to facilitate transitions up to standing, or down to sitting positions (Drive Medical). These cushions help the elderly, the disabled, or those recovering from injuries to avoid painful and unhealthy back and hip motions by rotating to standing (ActiveForever). ​Are you looking to use this in a car or for a regular, flat-surfaced chair? They can be placed cars, though if you have concave, bucket car seats- it may require some tinkering to get it set up right. For cars, the flatter the surface, the better- our best advice is to try one out and return it if it doesn't function the way you want in your automobile. *If the Vive is out of stock, our next top pick is the DMI 360​. The Vive Padded Swivel Seat Cushion is made of contouring foam that is designed to meld to your body. This helps to decrease hip & back pain as you pivot in your seat to an orientation comfortable for standing. Its cover is machine washable and ships with a lifetime guarantee. One woman recovering from hip replacement surgery, told us that it has helped her get in and out of her SUV, plus it gave her height a needed boost while she drove. A tall man, on the other hand, found that he had to lower his seat significantly to accommodate the extra boost- but it has ended up being the smoothest means of transitioning in and out of his vehicle. It's important to note that Vive specifies that it is only intended for flat surfaces, so if your car seats have deep, bucket seats, it might not work for you. Lots of modern cars do possess dynamic seat positioning systems- so you can 'create' a flat surface, to some extent, to help adapt to this cushion's design. The Standers cushion, we should also note, is designed for car seats, though it has received some negative feedback from a 225+ lb buyers we spoke to who didn't get enough rotation support from it. Let's take a look at 5 of the best-selling options on the market today and see how they compare. 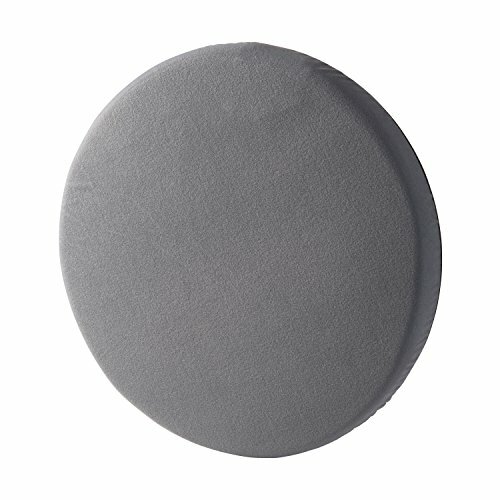 This gray swivel seat cushion offered by Drive Medical is well-made, convenient and portable. Users love that it rotates easily, but some do note that it’s hard to adjust it properly. This swivel car seat is made of polyurethane foam, and it has a soft velvet cover, a weight of 3.25 lbs, and a non-slip base for stability. It allows you to turn up to 360 degrees, and it measures 15.625 inches in a diameter. The recommended weight capacity is 300 pounds. 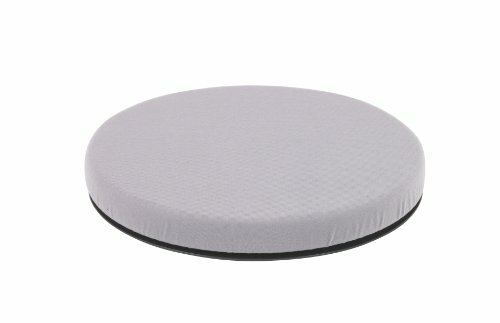 Overall, this is a perfect rotating cushion if you are looking for something cheap and durable. A buyer comments that the swivel seat arrived quickly and that it’s extremely useful for transferring in and out of a car. The reviewer adds that it’s ideal for anyone that has a bad hip. Another user shares that he uses it every day and that he is very impressed with the achieved results. He also says that his 91-year old friend never leaves his house without his swivel car seat, and he doesn’t have any issues with it. A satisfied purchaser says that the Drive Medical seat cushion allows him to extend his legs, and he can maintain a comfortable driving position. However, some customers have complained that this swivel car seat is uncomfortable to use, especially for a long drive. Some also note that the seat doesn’t stay in one place and that it’s not as useful as they expected. This swivel car seat offered by Vive is versatile, easy to use and it’s useful for getting in and out of your seat. Users love the size and the quality of the seat, but some do note that the cover often comes off. The Vive swivel seat is made of comfortable contouring foam material that prevents back and hip strain. It has an anti-slip surface, a removable, machine-washable cover, and it pivots up to 360 degrees. The seat comes with a lifetime guarantee, but you should be aware that it’s suitable only for flat surfaces. A user mentions that the Vive swivel cushion seat withstands his 252 lbs without any problems and that it’s perfect for his hip fracture. The reviewer also shares that it’s easy to swivel around and that it’s an invaluable help for getting in and out of his car. Another happy buyer comments that the rotating swivel seat was well packed and that it’s ideal for his mother who has Parkinson’s disease. He also says that it increases his mother mobility and that he highly recommends it. However, some customers have complained that the swivel cushion doesn’t work as well as they expected and that it doesn’t fit their seat. Some users also state that it moves around and that the glue melts from the heat of the car. If you’re looking for a swivel cushion of high quality, you might take a look at this deluxe car seat offered by DMI. Users love that it spins smoothly, but some do note that the seat doesn’t work for them. This deluxe swiveling seat is made of 1-3/8 inch thick foam, and it measures 15 inches in a diameter. It rotates up to 360 degrees, and it has a non-skid, flexible base that contours to the shape of the seat, a weight of 2.1 lbs, and a machine washable cover. The recommended weight capacity is 300 pounds and it’s available in several colors. In general, buyers have a favorable opinion regarding the DMI deluxe swivel seat cushion, and they praise its performance, usefulness, and practicality. A user comments that the cushion is well-assembled, swivels without an effort, and works flawlessly. The reviewer adds that the cover makes it easy to scoot over and that it’s comfortable to sit on it. Another purchaser mentions that he takes the swivel cushion with him wherever he goes and that it reduces the strain on his hips and back. A buyer comments that the swivel seat is a great help to his 94-year-old father and that he can get out of his chair without straining himself. However, some customers have complained that the rotating seat cushion doesn’t last very long and that it’s too firm to be comfortable. Some users also state that it doesn’t work with bucket car seats. This rotating seat offered by Standers is practical, comfortable and convenient for recovering patients. Users love that the cushion fits well on a chair, but some do note that it’s not what they expected. This swivel cushion has a low profile, and it measures 18” x 18” x 1”. It features a non-slip surface to prevent the seat from slipping and a weight of 1 pound. The cushion allows you to rotate up to 360 degrees so that it would be easy to get in and out of a car. It’s suitable for chairs, cars, trucks, and vans. In general, users have a mixed opinion regarding the Standers auto swivel seat, and they agree that design has room for improvement. An unhappy customer mentions that the cushion is made of two circular pads that are sewn together and that it doesn’t rotate at all when he uses it. Another buyer shares that the auto swivel cushion works well, but it should be thicker. The reviewer adds that it’s not very useful for leather car seats. Another purchaser also says that the seat doesn’t turn at all and that he had to return because it was too uncomfortable. On the other hand, a happy user mentions that the swivel seat works great for getting in and out of his car and that he is satisfied with how comfortable it is. A purchaser also states that the seat cushion swivels easily and that it’s perfect for recovering patients. This swivel cushion seat offered by Medline is well-designed, light, easy to store, and suitable for anyone that needs help getting in or out of a car or a chair. Users love the size and the color, but some do note that it’s quite firm. 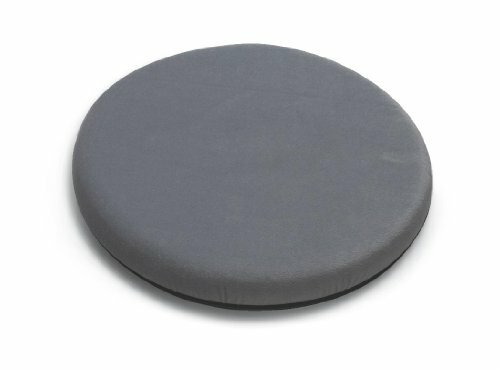 This rotating cushion measures 33” x 17” x 4”, and it’s filled with foam on the inside for added comfort. It features a slip-resistant base to provide extra stability and a removable cover, which you can wash in your washing machine. The recommended weight capacity of this swivel pillow is 300 pounds. As a whole, users have a mixed opinion regarding this auto swivel seat, and they agree that the cover needs to be improved. A purchaser mentions that he was hesitant to try the Medline swivel seat, but his mother uses the seat in his Ford Explorer. The reviewer adds that the swivel cushion makes it much easier to get in and out of a car than a regular pillow. Another user comments that the automobile seat is well-made, but it’s not suitable for many cars, and it slides around the seat. An unhappy user adds that the swivel seat does its job perfectly, but the cover slides all the time. He even had to glue it to make it stay put. A buyer also shares that the Medline swivel seat is perfect for people with mobility issues and that it gives him the necessary independence. The first swivel seat cushion we took a look at was the Drive Medical option- it is a 15.63 inch diameter swivel seat cushion for car that has a weight capacity of 300 pounds. This soft, padded option is designed to make it easy to get off or on to a chair or seat. Drive says that it will help you or a loved to do a 360° turn so that you can swing your feet to a space where is easiest for you to rise. One user we interviewed said that it works in smaller cars if you're looking for an automotive swivel seat. This padded swiveling seat is made of foam and has a 1 1/2 inch cushion height. 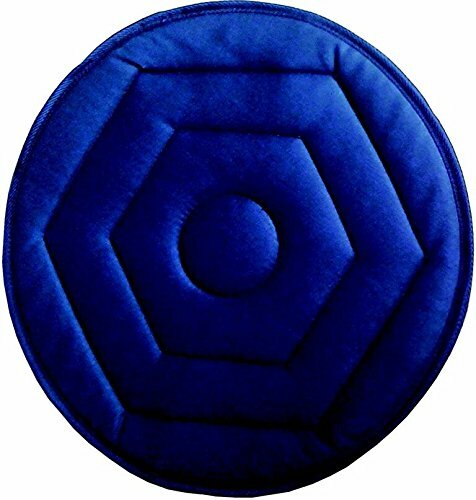 One buyer we interviewed who suffered from a variety of back pain problems said that this swiveling cushion pad is essential for him in his car because he has such trouble getting in and out of it. However, he says that if you're looking to buy one of these for your automobile, you will likely have to do some tinkering to get it to fit right. In his case, he says that he added some high-powered adhesive tape to the bottom to ensure the swiveling seat gripped onto his car's bucket seat surface. Another reviewer that we interviewed says that as a long-haul trucker with some painful lower back problems that this soft, Drive Medical rotating cushion is a tremendous help getting in and out of his cab. Another reviewer told us that the swiveling functionality was smooth, but it does need to be modified somewhat with gripping strength on the bottom so that it will stay in place and your automobile. Another reviewer who was recovering from lower back surgery says that she uses it in her car because of her advanced immobility as well as in common household seats. One bit of advice she has is to stack this swiveling seat atop a gripping cushion so that it doesn't slide around or feel insecure in concave, bucket seats. The Vive pivoting seat cushion is a sit and spin adult option. Vive says that their foam car swivel seat is designed to be anti-slipping, capable of decreasing hip and back strain, easily machine washable, equipped to provide a 360° rotation for elderly or somewhat incapacitated users to get out of and into any style of seat. Buyers tell us that they have installed this in the cars, even those with deeper bucket seats, albeit with some modifications. Users say that it has been essential to facilitating entry and exit of their sports utility vehicles and smaller-model automobiles. Another reviewer whose elderly father suffered a severe hip fracture says that they use this swiveling seat to transition him in and out of his walker to the bed. Another buyer who is undergoing hip replacement surgery purchased this option in anticipation of a lengthy and immobilizing recuperation- hoping that it would help her as she gets into and out of her Honda Accord. The third option we examined was the Duro-Med swivel seat pad, which the manufacturers say has the ability to change your stationery home chairs into swiveling seats that reduce the pain and discomfort on your hips and back. It has a weight capacity of 300 pounds and its non-skidding base is designed to contour to different seat shapes, effectively staying in place as you perform your turns. One buyer says that using this swiveling seat cushion in her car help to relieve the hip flexor pain she was experiencing, though she did have to lower her seat a good deal to adapt to the increased height this cushion added as she drove. As well, the fabric doesn't bunch up if you make micro adjustments as you sit on it, which is helpful because it's likely you will need to move around a little bit after you have settled into it or are preparing to transition off of it. Another reviewer told us that he suffers from painful arthritis that had made stepping in to his car, bending over, prohibitively uncomfortable. With this Duro-Med swiveling seat cushion, he's able to turn, and then sit down onto the cushion, before swiveling his legs into the car, placing him in a comfortable driving position. As well, when he and others need to exit their automobile, all you need to do is open the door, swivel to the left, place your feet outside and then stand up in a natural manner, using the frame of the door as support. Yet another reviewer we interviewed who has handicapped parents say that the swiveling automobile seat cushion has been a lifesaver for them, enabling the family to transport their senior citizen relatives to doctors appointments without as much hassle getting them in and out of the car. The fourth option we looked at was the Standers auto swivel cushion seat. 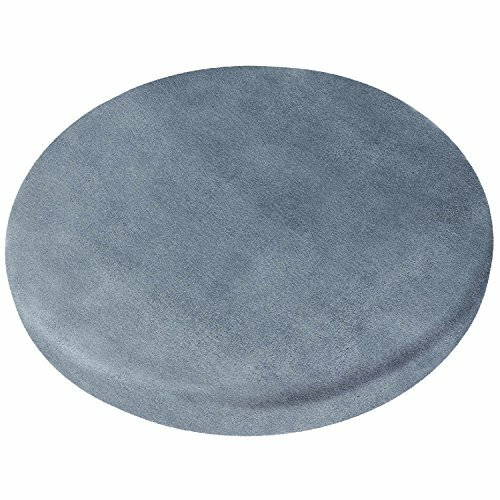 This swiveling vehicle car pad has a non-slipping surface to grip the cushion in place for use and home chairs and vehicles. It measures 18" x 18" x 1". Users we interviewed provided mixed feedback for this option, saying that if they weighed in excess of 225 pounds there was some difficulty performing the 360° swivel. On the other hand, another reviewer told us that it has worked in their concave vehicle seat, although they have modified it to work in conjunction with a cushion. On the whole, reviewers indicate that this is not as sturdy an option as some of the other memory-foam swiveling car seat cushions we have examined, and for this reason is not one of the recommended buys. The Medline swivel seat was the last option we examined- it has a weight capacity of 300 pounds, includes an anti-bacterial machine washable cover and features a slip-resistant bottom surface. As with the other swiveling seats we examined, users have had mixed results employing them inside of their vehicles, saying that for some they worked well, for others there was some difficulty adapting them to the contours of their vehicle seats. Some users complained that the fabric pulled off the seat and requires some taping to keep down. Other buyers looking for swivel car seats for the elderly or just padded automotive seat cushions, found that while this one wasn't a completely ineffective option, it does require some elbow grease to get it up and running the way they wanted for themselves or their elderly love ones suffering from mobility issues. Whether buyers are in Canada, the United Kingdom, Australia, New Zealand or the United States, swiveling cat seat cushions were best purchased online where users said they found the most competitive pricing and selection.